Home-builders in North Texas experienced their best selling season in seven years over the summer of 2014 according to the Dallas Morning News. While this increase has home-builders excited, it has also brought on concerns for economists in the area. Although developers are enthusiastic as demand for new homes in the Dallas-Fort Worth area are exceeding supply, they are experiencing shortages in labor and rising costs of supplies, combined with tougher mortgage standards as well as delays in land development. These issues slow down the entire process. New homes started this year are only about half of what they were before the housing collapse, but numbers are estimated to be higher in 2015. The local job economy is seeing growth as well; which makes builders excited as the demand for new homes is not likely to fall. Dallas Morning News reports…”Phil Crone, executive director of the Dallas Builders Association, said ‘Home-builders’ confidence in the market is at its highest level since before the recession. They are riding the rate of job growth and the population growth, which is making things pretty good for them,’ The lot inventory and their being able to keep up with the demand is a concern.There are certainly no concerns with overbuilding.” Economists in the area are concerned about rising costs of new homes. The construction costs have been estimated to have risen anywhere from 6-8% in the area, and these costs are then passed on to the buyers. It is anticipated that they will continue to rise. As an investor, this is a good time to purchase before those costs inflate more. With the boost in local jobs coming from companies like Toyota and other out of state firms moving in, the city is experiencing growth in population as well. 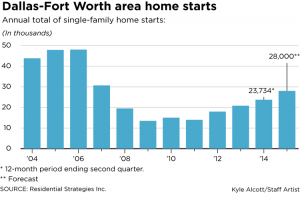 No matter where you are in the investing process, Dallas-Fort Worth is an area not to be overlooked. The Dallas Property Management team knows the area, and can assist with any needs you may have in the buying process or with the management of your rental property.